When hand picking, call in re-inforcements. I'm seeing quite a few of these passion bugs in the garden areas. A little closer up, after feeding. I have never worried about the holes in my bean plants before. This year they are particularly bad. What should we do? Mine are much worse this year also. I'm just being more aggressive with picking and smashing the critters. 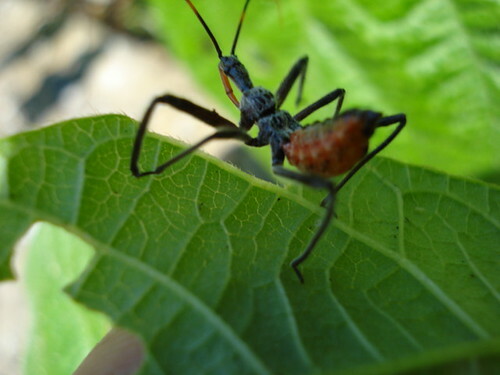 One hand over the top of the leaf, one hand under and then either pick the beetle or he drops into your lower hand. another technique that I'm using is to simply bend the bush over and tap it. Then lift and there are usually a few beetles running around which get smashed. They generally hide very quickly under any piece of cover, so smash quickly! I probably have the equivalent of 30 feet by 40 feet of bean rows, though most are planting in little groups and scatterings. The beetles are definitely bothering the rows and the block plantings more than the interplanted groups. I've got quite a few holes in the leave of most groups of my beans, but don't think that will affect the crop very much. Sorry I can't give advice about the beetles. I am a beginning gardener. But, my parents live in Camden and I grew up there. I was just checking out this forum for advice about mulching in my veg garden and saw you were in Camden. It's a small town. You may know them! Do Worms Like soapy dead Blister beetles and dung beetles? Bush Bean crop size = Pole bean Crop size?? ?